If you haven’t been able to tell by now, I am a collector. Of many things and for a variety of reasons. Most things have some connection to my family and great childhood memories. I guess I keep coming back to trying to recreate those good feelings. One of the things that I have collected is china. One of the downsides of being from such a large family is that when family treasures are passed down, there has to be a way to share with all the grandchildren. In the case of my father’s mother, she had a LOT of grandchildren. Luckily, my dad was her youngest (and from what I have been told, favorite) child. So her china went to the oldest daughter… unfortunately not me. But me and my youngest sister, did get one place setting of her china. So, I quickly went about collecting enough for a a dinner party of eight. Then ten. Then fourteen. I think I have enough to host a dinner party for at least twenty now. It’s a beautiful pattern, actually produced for distribution as a promotion at gas stations during World War II. It is called Bermuda, by the company Johnson Brothers. My Dad used to send his mother money while he was serving in the Navy and she slowly collected a set during his service time. Unfortunately, she was never able to add the serving pieces, apparently they had to be purchased directly from the company. So, I was able to find most of the pieces: platters, serving bowls, gravy boat, tea pot and a coffee pot, demitasse cups, two handled bowls, shallow soup bowls, desert plates… you name it, I found it. I invested a lot of money and time and I love feeling like I have a very small piece of my grandmother. 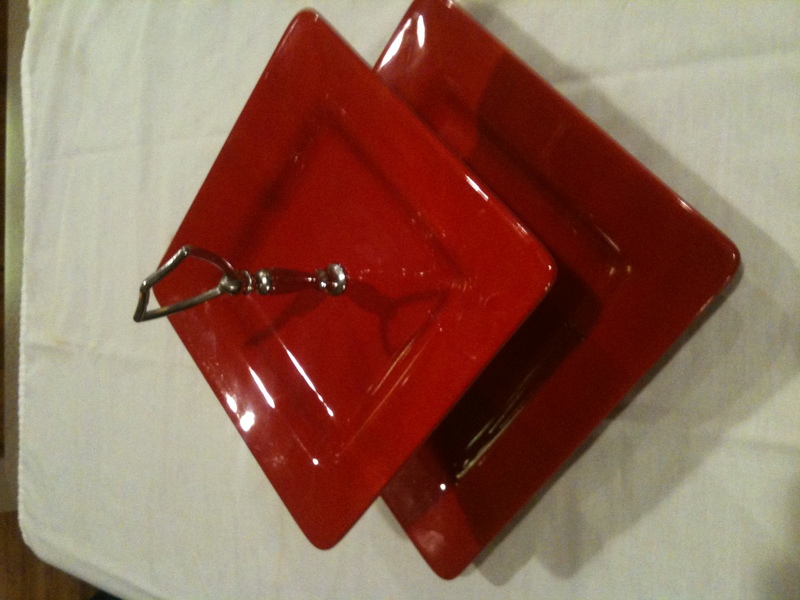 One piece I never found (not actually sure they made it) was a tiered serving plate. So I decided to make one. A few years ago when I was actively collecting the china, I found one online from another pattern that had a broken bottom plate. I actually collected several of differing patterns, looking for the most perfect one. I finally dug them out last weekend and put together the piece; this one was three tiered. I think it turned out fabulously. Before I actually attempted to drill through my antiques pieces, I decided to try my hand at my everyday dishware. Of course it’s red, a heavy duty square pattern meant to be really used from one of my favorite stores. 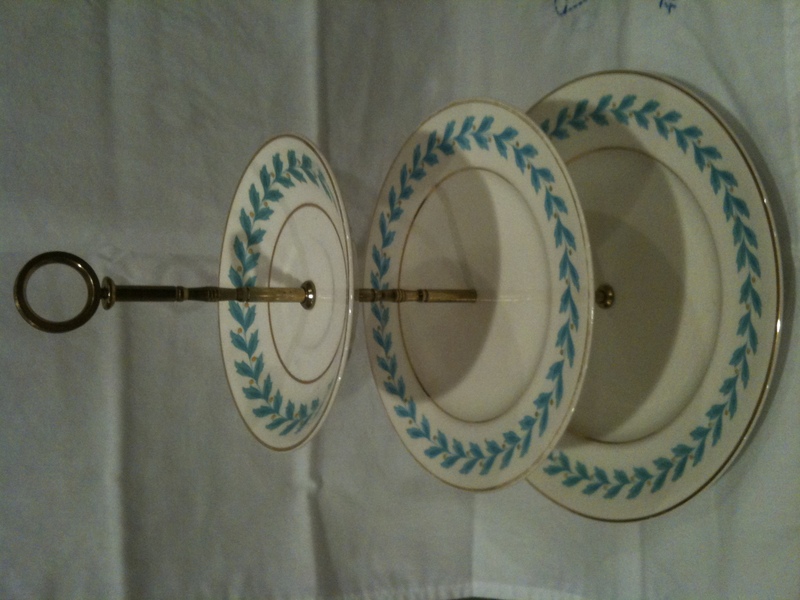 It’s only two tiered but gave me the confidence to drill my grandmother’s china. When we baked cookies on Christmas Day, we put the first two dozen here. It’s now one of my favorite pieces and I hope to use it often. I have another pattern from my maternal grandmother and my mother’s china and actually my own china. So I have a few more to create. They’re easy and fun. All it takes is the hardware, a china drill bit and a drill. Hope you enjoyed today’s project. Happy Crafting, y’all!